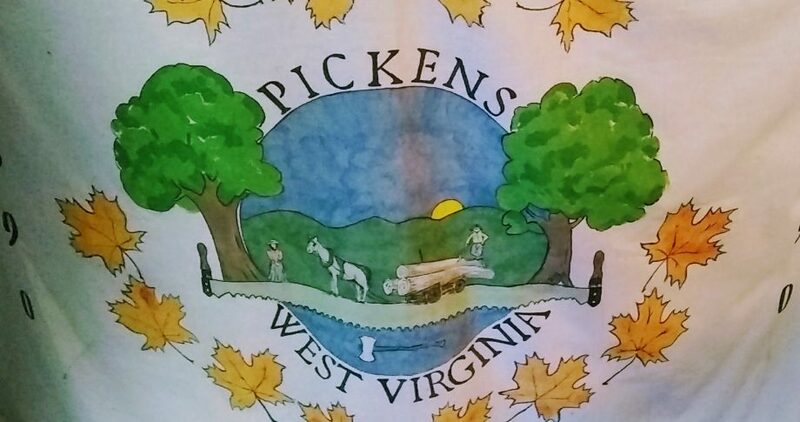 Spring in West Virginia has been overly hot and wet this year. It is causing my family frustration with the home remodel but is making perfect weather for mushroom hunting. So I have been able without much effort to find some wonderful large wild mushrooms this year. But finding wild mushrooms is the easy part. I then have to identify the fungus and find the best way to consume the treasures. Some times that is more work then just finding an old log with a mushroom growing out of it. 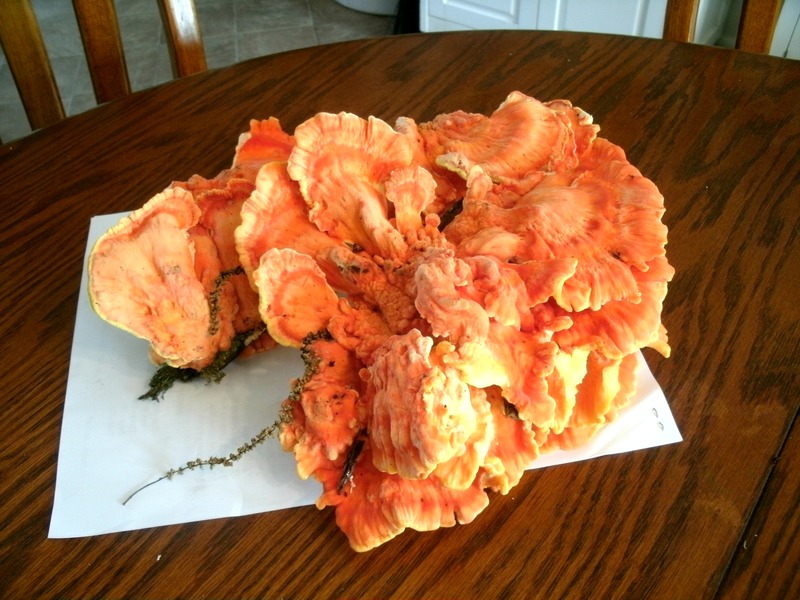 This mushroom is very common in the Ohio Valley or the Eastern US and it is named after the city of Cincinnati Ohio where it was first found and Identified ( Laetiporus- Cincinnatus). The common name is Chicken mushroom and it is edible and delicious. it is a mushroom that will regrow if collected correctly and the “stem” is left on the log or stump when gathering. This is one of a small group that grows in a rosette style rather than a single stem with cap.This is also one of the few mushrooms that freezes well. In this case the mushroom weighs about 2 pounds before cleaning and trimming and about is the size of a 13 X 11 sheet of paper. So I have enough mushroom to make several meals… in this case I will make two and then freeze the rest for a cold day to make a baked steak slow cooker dinner later in the fall. As with any wild mushroom I will remind you that you need a good mushroom identification book or two and or person who has experience hunting wild mushrooms before eating. Many wild mushrooms are poisonous and some are deadly within hours. I use a book titled Wild Edible Mushroom by Hope H Miller for almost all mushrooms we hunt and eat.The link above it to its listing on Amazon.com. It has wonderful color photos of the most easy to identify edible mushrooms. We are also lucky to have friends that hunt the mushrooms that are in this book and we share information and at times hunt for them together. After bringing this boy home I needed to clean it. Because it is a large stalk style mushroom that is not tender to the touch, soaking in a sink full of cool water encourages any bugs, sticks, slugs and dirt to slowly drop to the bottom of the sink. I let mine sit in the water at least two hours. In this case it soaked over night. Then I trim the “petals” off the base root that is white, leaving only bright yellow backs on the mushroom. I even trimmed it again when I was getting ready to cook it just to make sure we got the most tender portion of the “petals” in my stir fry. A stir fry is the most common way we use fresh wild mushrooms. In this case I just added the chicken mushrooms into a vegetable mix we already had in the freezer added some beef and topped it with our favorite sauce and dinner on a hot humid West Virginia night in about 15 minutes. 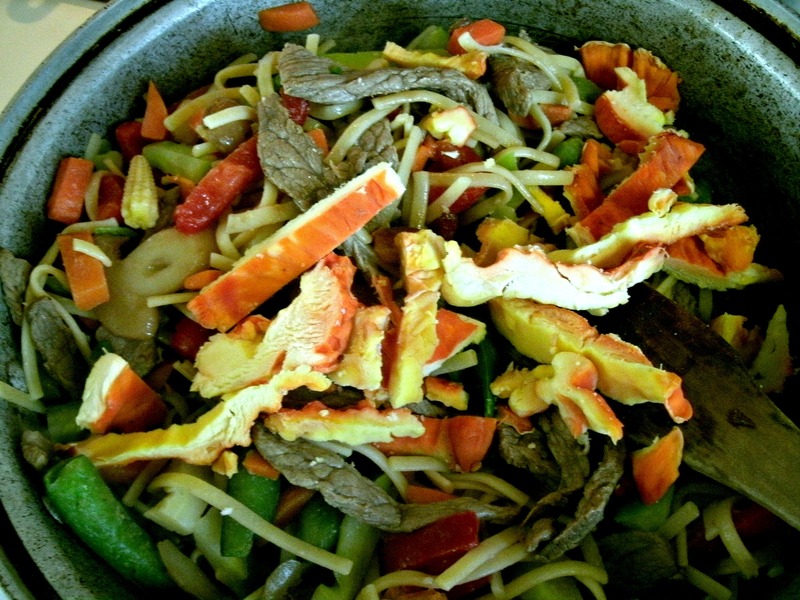 I stir fried the thin sliced steak in two table spoons oil at a high heat and then removed them from my skillet or wok. I added 2 pounds of frozen stir fry vegetables. In the mixture I used it already had the noodles in the bag. I added them to the hot skillet and stirred in the wild mushrooms. It took about 13 minutes to steam the vegetables and make sure the mushrooms cooked tender. I added the steak back in to the skillet and added half bottle of Teriyaki sauce. Pretty simple but a Delicious way to add wild mushrooms to any stir fry. We also love this mushroom breaded and fried in butter with a little Old Bay Seasoning as great appetizer before dinner. It is another way to introduce friends and family to the joy of mushroom hunting when you can share a large plate of crunchy, juicy ,wild food that tastes so good! Happy eating and keep you eyes open for wonderful mushrooms that grow just about anywhere. This mushroom was about 100 feet from a barn under a thin canopy of trees on piece of log maybe 10 years old.